We like to believe that if you solve a real problem with a good product, a successful software business is magically created. That’s never guaranteed. The popularity of product-first businesses has led to short-sightedness around what’s necessary to create a sustainable business. 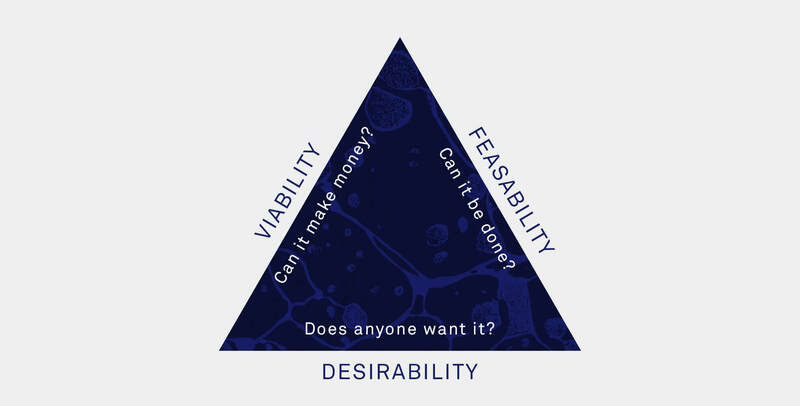 I’m reminded of this triangle I frequently draw for founders; no two sides are sufficient. There are a few very specific traps I often see founders fall into and struggle with. Rather than name names, I’ll share the general principles that I encourage. Some problems persist because they’re quite simply not worth solving. Big, frequent problems e.g. collaborating on a document, communicating with customers, chatting with teammates, etc. This is a great place to be. Small, frequent problems e.g. scheduling a call, sharing an image, recording an expense. This is a good place to be. Big, infrequent problems e.g. running an employee survey, booking complex business travel, preparing in-depth reports. This is a good place to be. 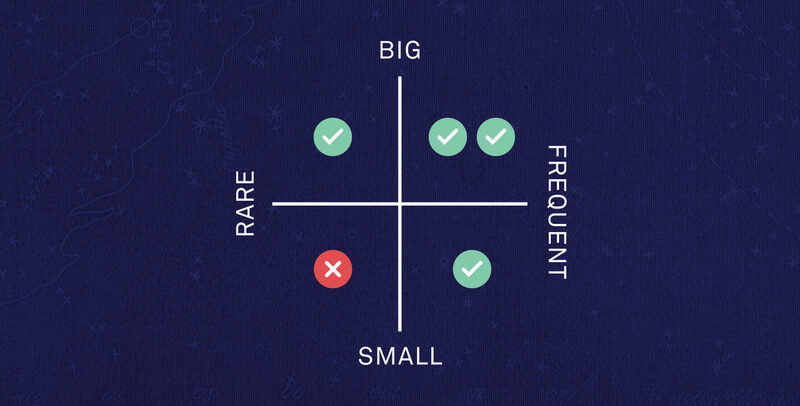 It’s the fourth quadrant where the risk lies. Small, rare problems might be desirable and feasible, but just not that viable. People won’t pay you a lot for it (if anything at all) and you can’t easily monetize through ads or sponsorship because by definition your engagement is quite rare. Ultimately, you can succeed as a product but still fail as a business if you find yourself in this trap. Some problems persist because they’re quite simply not worth solving. To have a successful product business based on a very cheap product, you need to follow a particular set of rules to keep your unit economics healthy. Customer-focused founders struggle with this. Everyone wants to do right by their customers, they want to help them adopt their product, and support them using it. But unit economics don’t care about hand-wavey justifications, they just sit back and spit reality at you. If it takes 4 hours to set up a new customer and you charge them $19/month, it will realistically take well over a year before you make money on that customer. And that’s before you factor in CAC (Customer Acquisition Cost) or the likelihood they churn out. If you’ve modelled this out and financed yourself accordingly then this can work, but if you’re bootstrapped you’re toast. 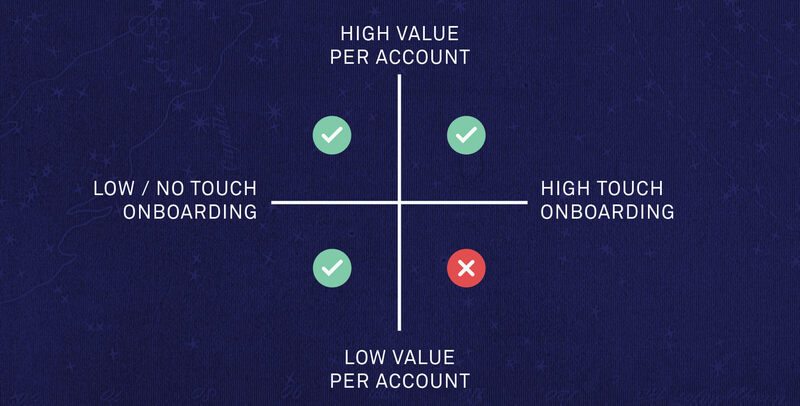 The key point here isn’t “always build a zero touch onboarding”; that’s not always possible. Some tasks require manual intervention, and you can’t control that. But you can control your price, so that’s how you address it. If you conclude no one will pay for it, and it’s not automatable, then maybe it’s a problem not worth tackling. You should do lots of things that don’t scale, but building a business model that doesn’t isn’t one of them. When I see the umpteenth “All your [Files|Accounts|Social Profiles|Images] in one place” type product, I worry. Consolidating workflows is generally a good thing, but consolidating unrelated data is rarely as useful, and pitching these types of products from a feature-first perspective exacerbates this. You can’t sell a solution to someone who hasn’t bought the problem. Most people deal with inefficiencies and contradictions in their lives, and are okay with simply remembering which photos they posted to FB and which they posted to Instagram. For many products the problem isn’t the quality, it’s the priority of the problem in the customer’s lives. If your potential customers don’t care about solving their problem, it’s a good sign you shouldn’t either. The best software is created and consumed in parallel. Its makers are its users, its users are its makers. This means there are certain types of problems that can’t be solved by founders early in their career: If you have only worked in very small companies you’ll struggle to build a wiki, or an intranet, because you’ve never experienced the frustrations they attempt to solve. If you’ve only recruited in ones and twos then you’ve never needed recruiting software, and if you’ve never dealt with a headcount in the hundreds you’re ill-equipped to build a HR system. A small group spinning out from a company, hell bent on replacing the worst tool they had to use in their previous job. A large-ish team with a struggling product who built an internal tool to solve a problem, and realise it’s potentially more valuable than their original product idea. Raw experience of the problem is an essential ingredient in the solution. Products match problems, so if your understanding of the problem is vague (e.g. “companies need to share information internally”), then your solution will be equally vague, and in this case would end up looking like a blog, and your poor marketing team will struggle to make a case why it’s more than that. If your understanding is sharp (e.g. “Companies need to store & share FAQs, Policies, Legal Documents, and How-Tos. They need to keep them up to date. They need to announce any changes, and have to control access to some information ”) then the solution and its product marketing becomes so much more sharp. You can tackle any of the the above problems with great products which have phenomenal aesthetics. Everything will be pointed in the right direction except for the business. But sustainability is an important feature. If a product can’t fuel a business then its quality will disappear as its value erodes and competition emerges. And that’s something a lot of great products forget: survival is the best product strategy.